Cloudveil, online at cloudveil.com, offers inspired mountain apparel for men and women. Cloudveil carries a selection of outerwear and apparel designed to handle harsh winter weather and mountain environments. Cloudveil offers pants, hats, gloves, baselayers, fleece, and jackets. Cloudveil products are designed with advanced technology for breathability, waterproofing, keeping wearers warm, and more. Cloudveil is a great resource for practical apparel for hikers, mountaineers, and active individuals. But before you shop, get all the latest cloudveil.com discounts, Cloudveil promotions, and Cloudveil coupon codes found here at RetailSteal.com. Cloudveil ships within the United States, and offers free standard shipping for continental orders $100 plus. Orders to AK and HI are shipped via UPS. Cloudveil also offers 2-Day and Overnight shipping. See site for more information. Save 15% on your purchase at Cloudveil using this coupon code. Shop today and save. 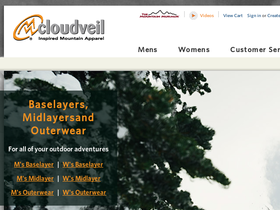 Shop online at Cloudveil.com and enjoy up to 40% off mountain apparel for men and women. Click link to shop. Enjoy free shipping from Cloudveil on your order $100+. Offer applies for purchases to the Continental United States. Click link to shop and save. Save 25% on Core Baselayers for men and women right now at Cloudveil. Click link to shop now and save. Shop at Cloudveil today and save 25% on select women's baselayers. Click link to shop and save. Save 25% on women's core tights at Cloudveil. Click to shop. Receive a free hat from Cloudveil online when you use our coupon code with your purchase of $50 or more.